Zaffagnini S, Marcheggiani Muccioli GM, Lopomo N, Bruni D, Giordano G, Ravazzolo G, Molinari M, Marcacci M.
Although meniscal injuries are one of the most common sports injuries, there is much debate over the optimal treatment that will maximize function and also reduce the chances of future degenerative joint disease. Patients with meniscal injury, meniscal repair or menisectomy have an increased risk of developing knee osteoarthritis, and these degenerative changes can begin within 18 months of the baseline injury. The authors in this study should be applauded for their comparative and longitudinal analysis of two meniscal surgeries: 1) a collagen meniscal implant (a type of meniscal allograft derived from collagen type I fibers from bovine Achilles tendons) and 2) partial menisectomy. Although the partial menisectomy is the more common procedure, the meniscal implant has been suggested to maintain more normal arthrokinematics and load distribution, both of which may lead to long-term preservation of joint integrity. The authors performed a minimal of a 10 year follow-up on 33 men (mean age 40 years old) who underwent either the collagen meniscal implant or partial menisectomy. The authors evaluated AP standing knee radiographs at baseline and follow-up to examine for degenerative joint changes and joint space narrowing. The authors also evaluated pain using a visual analog scale, self-reported knee function using the International Knee Documentation Committee (IKDC), Lysholm knee score, Tegner activity level questionnaires, and SF-36 (a questionnaire pertaining to the patient’s perception of their physical function). MRIs were also taken to evaluate the meniscal implant and joint integrity. The most interesting findings from this study were the group comparisons. Patients who received the meniscal implant had lower pain scores, higher IKDC scores and better higher Tegner index compared to the partial meniscectomy group at 10 year follow-up. The partial meniscectomy group also showed greater joint space narrowing on the x-rays, which indicates a greater loss of cartilage (or faster progression of knee OA). As clinicians, we play an important part in rehabbing athletes so they can resume their previous level of activity. In patients with knee pathology, improving strength can also reduce the chances of OA progression in at-risk joints (quadriceps weakness has been shown to pre-date the onset of cartilage changes in the joint). For this reason, rehabilitation specialists, whether they be physical therapists, athletic trainers, etc., are the first line of defense against OA progression in patients at higher risk for cartilage deterioration. Sometimes that is not enough. This seems to be the case in patients with meniscal injuries, particularly those people in the mid-40s. Surgical treatments that maintain a normal micro-loading environment are needed to prevent future joint problems. Although meniscal allografts have been suggested to be an improvement over traditional meniscectomy, there has been very little research to support this. This study is a first step towards understanding which interventions provide optimal long term outcomes. Joe, Thanks for the great post. On the MRIs, were the authors able to determine if the meniscal implants were holding up well after 10 years? Joint space narrowing isn't just an indicator of cartilage loss but also an assessment of meniscal pathology (e.g., degeneration, extrusion from the normal position). It is possible that the patients who received the implant had less joint space narrowing because the implant was holding up while the partial meniscectomy group was seeing their meniscus get worse and worse. Good point. The authors used the MR images to quantify the quality of the allograft over time, and to evaluate the evolution of the implanted material. They found that over 50% of the patients demonstrated myxoid degeneration at the follow-up visit. This occurs when a collagen substance becomes more mucoid-like. In other words, the meniscus gets mushy. This is not entirely an unexpected finding because the implant is a tissue engineered structure, not a native meniscal autograph or allograph. 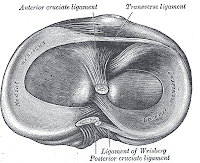 They did not report on any structural changes, such as loss of height of the meniscal or extrusion from the normal position for either of the groups, so it is hard to say what the influence of meniscal changes were on the joint space narrowing. The authors also used the MR images to evaluate the cartilage integrity though. Although the difference was not significant, they found a trend for better cartilage integrity in the allograft group using a score originally designed to quantify chondromalacia. This is an interesting finding, suggesting that there may be a true condroprotective effect from the allograft. It will be interesting to see if these results are consistent with future long-term reports with larger sample sizes. 1. What was the thought process in utilizing fibers from the Achilles tendon rather than rely on a manufactured substance that may otherwise hold up more successfully at the 10 year mark? Is rejection a concern? 2. There has been some concern with implants being unable to provide or sustain synovial fluid concentrations found coexisting with an original menisci, has utilizing fibers from the Achilles tendon resolved this issue? 3. If the problem lies within the allographs becoming mucoid-like after 10 years, are the patients prompted to receive another allograph at that time or rather have the allographs removed and continue forward with another mode of rehabilitation? I always find research on meniscal injuries fascinating! I am curious as to why a meniscal injury is not repairs to the same measures as an ACL, for example. I was curious to see if any of the collagen implants were naturally rejected by the body, causing further issues or injuries. I think this structure has a lot of room to explore the possibilities for the most appropriate rehabilitation measures.